There are times in your life when it seems like everything is going crazy. There are times upon your earth where you feel the same. Yet in the midst of the so-called chaos a greater order is emerging. Sometimes what is not working must be revealed to be healed. Sometimes you need an outer reflection of what has been blocking you from within. Sometimes you are simply seeing the effects of past creations, in stark contrast to what you desire now. When you feel your life has become chaotic and you don't know how to fix it, be still. Sit. Breathe. Receive. 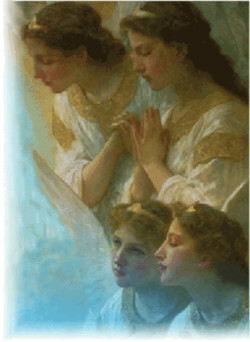 Your angels and the Divine are always there for you, just waiting to assist you if you'll allow for it. When you don't know what to do next, God does. When you don't know where to turn, turn inward. When you don't know how you'll get through something, remind yourself you don't have to know how to handle anything but the present moment. Breathe. Love is always with you dear ones. Love is always trying to assist you. Love is always trying to solve your problems, address your challenges, heal you, inspire you, and uplift you. Love is always attempting to flow. You have your hands on the faucet. Will you allow a trickle into your life by trying to handle challenges on your own, or will you allow a great flow of grace to assist you? It is always there. If the moment you had a problem, instead of allowing the mind to spin its wheels and confuse you, you could sit, breathe, and receive, then you would immediately begin to receive our guidance. Dear ones, we love you so much. You are surrounded by and indeed sourced by the love of the Divine. This power of love wants to help you with every single challenge you face and, if you allow for it, can help to create absolute miracles in your lives.